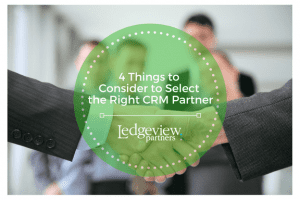 When it comes to selecting the right CRM partner for your project, you must acknowledge it as a critical step in your process. Do not underestimate this phase of the CRM Implementation process. You need a partner to succeed, and shouldn’t go it alone! Just as you are experts in your business, your CRM partner is an expert with CRM. Be thoughtful during the evaluation period to find the right fit for your organization. Don’t settle for your first Google Search result. Do your homework. You want a partner that fits your culture as much as they understand your needs and desired end-result. It’s important to enjoy working with your CRM partner because you will be spending a lot of time with them. Treat this phase of your CRM Implementation like a job interview! What do you need help with, with your CRM implementation project? Do you need help selecting the technology, or have you already found the technology you want but need help with the design and implementation phase? Identify where you are now to know where you need to go with your CRM partner. Consider where you need them to jump in. Do you need help with training, for example? Answer these question to define what you need out of your partner. Despite wanting a partner with CRM experience, you need to determine what additional qualifications they should have. For example, do you want a partner that takes on a more holistic approach to your business? Do you want help with Sales, Marketing, and Customer Service as well as with CRM? Do you want a partner with specific experience or focus in your industry? Do you want to work with a consulting firm whose employee count is close to your own, who understands the small or large needs of your business? Do you want a partner whose business mission aligns with yours? These are just some of the questions you should ask. Be considerate for your organization and team when you are evaluating potential partners. This step means a lot. As was mentioned earlier, you need to treat this step of the CRM Implementation Project like a job interview. Contact partner references to see if their credibility and reputation hold up. Research case studies or testimonials from previous clients of theirs. Potential CRM Partners should have these resources available to you. This will increase your confidence and comfort knowing they have successfully completed other projects with like-minded organizations. Once you have selected a CRM Partner, it’s critical you are clear with them from the get-go. Be sure to articulate your expectations to them. Set the stage up front to define what will make the project a success between you. Learn more about what makes a successful CRM Implementation. 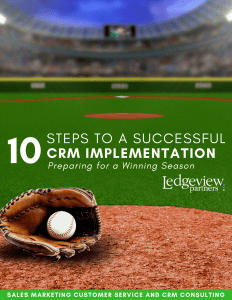 Download Ledgeview’s new eBook: “10 Steps to a Successful CRM Implementation: Preparing for Winning Season” here.